The New York Times reports on a new poll released by the Pew Forum on Religion and Public Life, which shows a relatively high level of fluidity in the religious identities of residents here in the United States. Analysts and scholars of the role of religion in public life have long understood the US exceptionalism with respect to the important role and place of religion in public life. This has occurred despite (although some would argue because of) the official church-state separation in US society. Most other states with developed economies are much more secular than is the United States, even though some of these states (such as Great Britain and Germany) do not have state/church separation. WASHINGTON — More than a quarter of adult Americans have left the faith of their childhood to join another religion or no religion, according to a survey of religious affiliation by the Pew Forum on Religion and Public Life. The report, titled “U.S. Religious Landscape Survey,” depicts a highly fluid and diverse national religious life. 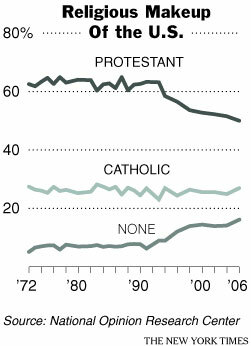 If shifts among Protestant denominations are included, then it appears that 44 percent of Americans have switched religious affiliations. For at least a generation, scholars have noted that more Americans are moving among faiths, as denominational loyalty erodes. But the survey, based on telephone interviews with more than 35,000 Americans, offers one of the clearest views yet of that trend, scholars said. The United States Census does not track religious affiliation. You can find the Pew Forum on Religion and Public Life here. Here is a link to a video interview with Pew Forum Director Luis Lugo who talks about the next step in data analysis. Lugo characterizes the United States as having a dynamic “religious marketplace.” Here is a link to an interview with Neela Bannerjee, the New York Times journalist, who wrote the article.